Turn your FORD into a mobile communications cockpit. Get behind the wheel, touch the big blue button on the IHF1000, and your car kit will follow your speech commands. Dial by name or number, mute and un-mute calls—even answer incoming calls with announced caller I.D. Stay connected with your own crew, hands-free, just like the racing pros. Answer or reject incoming calls with announced incoming Caller I.D. 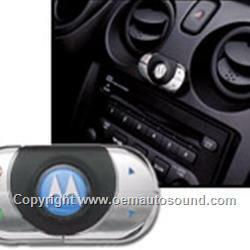 The IHF1000 car kit supports Bluetooth Hands-Free Profile. Your phone must support this profile. Not compatible with the Motorola DC600 wireless adapter. Motorola V710 requires software load 8700_01.40 or higher.